How can I share sitemaps and user flows I create in Timblee? In Timblee, you can share projects in one of 4 ways – via a unique share link, email, downloading them as a PDF, or as images. To do so, open the sharing menu via the more option on each sitemap, or if you're in a particular sitemap, via the share button. First, choose to exclude User flows or exclude sitemaps if you only want to share one or the other. Then choose how you want to share the sitemap. 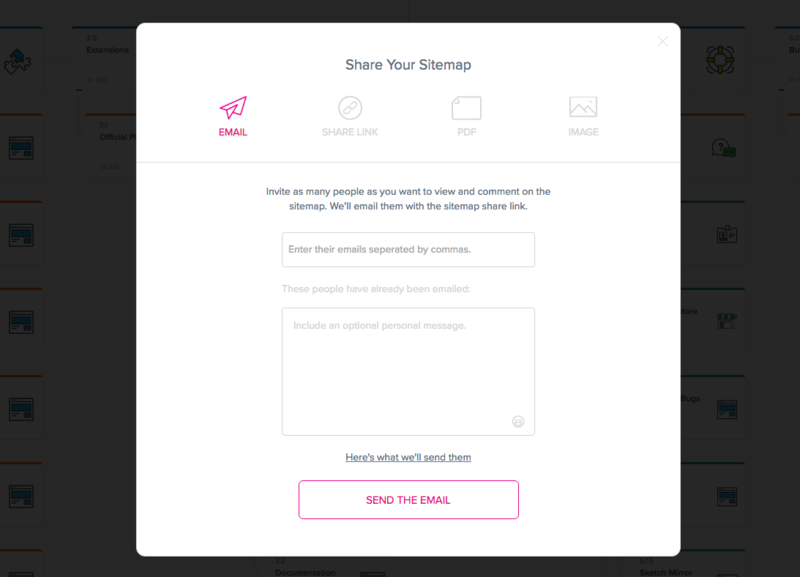 You can email the share link to anyone directly through Timblee. This instantly sends them a beautiful email with the share link. They won't even need to log in to view the sitemap. You can include an optional personal message as well. If you prefer using your own email program, just copy the unique share link – then give it to anyone you want to have access. This gives them read-only access, with the ability to add comments if they identify themselves. Need to share or view the sitemap offline? Or perhaps print it out for a meeting? Export it to one of three PDF sizes and optionally include comments as well. For the times you need to embed the sitemap into a proposal or other document, you can export it as an image. This will generate a zip file with multiple images (one for the main sitemap, one for footer pages and one for each section you have in your sitemap).